We rode our bikes along the Sacramento River Bike Trail from the Keswick Dam downhill into Redding. Continuing on the trail we came to the Quartz Hill Road (Redding Trestle) Underpass (06C0143). It's a long steel girder bridge on a tight radius curve (for a railroad) with tall steel towers and with concrete piers supporting three deck truss spans over the river. 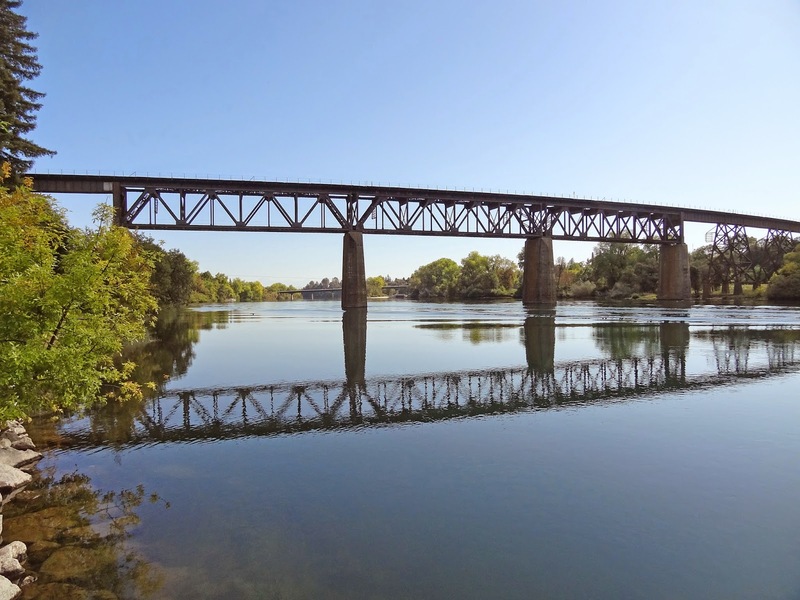 The bridge is currently owned by the Union Pacific Railroad. The deck is 110 ft above the river in order to climb (and descend) the hills north of town. It was built in 1939, as part of a new alignment required by the damming of the Pit and Sacramento Rivers. Shasta County, California Bridges: Quartz Hill Road Underpass (1) by Mark Yashinsky is licensed under a Creative Commons Attribution-NonCommercial-NoDerivatives 4.0 International License.